On August 6, 2017, five young Brothers from the Lasallian Region of North America (RELAN) entered the Regional novitiate where they will spend the next year in deep discernment. Brothers Paul Avvento and Steven Barbaro, from the District of Eastern North America and Brothers Mark Engelmeyer, Matthew Kotek and Dylan Perry, from the Midwest District, join Brother Thomas Johnson, FSC, novitiate director, and Brother Stephen Olert, FSC, novitiate sub-director, for the yearlong journey. The novitiate is located in Chicago’s Hyde Park-Kenwood neighborhood in order to take advantage of the theological, inter-community and ministerial resources in the area. The novices will participate in an Inter-Community Novitiate program with about 30 other novices from men’s and women’s congregations as part of their year of spiritual development. 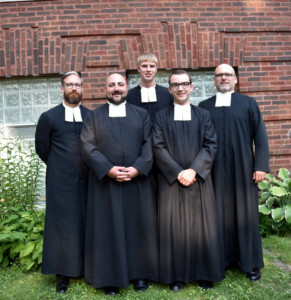 Click here to learn more about Brothers Paul, Steven, Mark, Matthew and Dylan. Please print the document as a reminder to pray for the Brothers during their novitiate year as they discern their commitment to lives as Christian Brothers.